… your coffee is already cold. Whether you get distracted or your mug just doesn’t retain its heat, it is absolutely disheartening—and, let’s be honest, kind of disgusting—to take a sip of your favorite brew only to find cold coffee. If you’d wanted cold coffee, you would’ve made iced coffee, right? Sounds like it’s time to upgrade your travel mug and stop settling for lukewarm java. It’s Just a Mug. What’s the Big Deal? When it comes to the perfect coffee carrying companion, you have to think about more than just the trendy brand or whether the cup has a handle. The primary purpose of taking your coffee with you in a specially designed mug is so that you can finish it before it gets cold, and without having to chug it. Not only that, but you don’t want to waste your perfectly brewed coffee, do you? The longer it stays hot, the more likely you’ll be able to finish it—not to mention, enjoy it—instead of dumping it down the break room sink when you get to work. So regardless of the name emblazoned on your it, the pretty colors it comes in, or the fact that it fits perfectly in your car’s cup holder, if your travel mug isn’t keeping your coffee hot for long enough to get you from Point A to Point B, it’s time to toss it and get one that actually works. To understand the best way to keep your coffee hot, you first have to understand what makes your coffee cold. To do that, you’ll need to think back to high school physics. Hey, you know making coffee is just as much science as it is art. When you pour a cup of joe, you expose your hot coffee molecules to the colder air molecules, not to mention the cooler molecules making up whatever vessel you’re pouring it into. The more exposure your coffee has, the more quickly it cools. You can fight conduction by heating the vessel you’re pouring your coffee into. Simply give your travel mug or coffee cup a quick hot water rinse. This warms the sides of your mug and reduces the amount of heat lost to conduction. Designing heat-retaining coffee cups—especially travel mugs—is a compelling problem. Unless you’ve got a real hankering for iced coffee, you want your favorite caffeinated beverage to be hot no matter when you take a sip. It might sound like fluff, but the vacuum insulation found in many travel mugs is the result of some really neat science. Instead of relying on the conductivity of the mug’s material to retain heat, vacuum insulation removes a large element of heat transfer by taking out the air between its metal layers. It’s basically a layer of molecule-less space between your coffee and the colder air around it. Of course, your typical vacuum-insulated travel mug will not have a vacuum-sealed lid—it would be much harder to get to your coffee if that were the case—but it still slows down the cooling process. That’s why vacuum-insulated mugs are your best bet for keeping your coffee hot. We’re all in favor of a mug that can keep your coffee hot for as long as possible. But if it’s not your style or in your budget, you can always check out travel containers that match your coffee-drinking speed. If you gulp more than you sip (we don’t judge), a less expensive insulated mug might be a better option for you. But if you’re the kind of person who gets so wrapped up in something, you forget your coffee is there, or you have a long commute in the morning, you definitely need a next-level travel mug. ThermAvant Technologies has no chill when it comes to keeping your coffee hot. 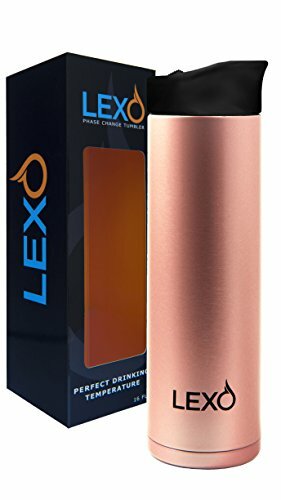 Their LEXO Temperature travel mug is made with material developed by Hongbin Ma, a University of Missouri professor of mechanical and aerospace engineering. The material cools your coffee to 140°F (60°C)—the optimal drinking temperature—in just two minutes. No, it’s not an electric mug. It uses phase-change material—which means it can both store and release large amounts of energy—and advanced heat transfer to maintain that perfect temperature for up to eight hours. The mug is made with triple-walled stainless steel and insulates both hot and cold beverages. It’s also dishwasher safe. It’s definitely a more expensive mug, but the technology and the promise of hot coffee is well worth the price. This UK-based company prides itself on craftsmanship, which is probably why this vacuum-insulated travel mug has eight layers. The outer stainless steel layer is covered by rubber electrolytic grinding and a paint coating on one side of the insulation. On the inside, you’ll find microwave copper plating, more stainless steel, and another electrolytic grinding layer for extra heat-trapping power. All told, the TOMIC can keep your coffee above 120°F (48°C) for up to 12 hours. The lid flips open for easy access and comes apart for even easier cleaning. The mug itself is made to resist rust, mold, and punctures so it can serve you piping hot coffee longer. It’s available in four solid colors, and four seasonal prints. In addition to its stainless steel vacuum insulation, the Zojirushi’s locking lid prevents wasteful coffee spills. The lid also has a two-step release process so you don’t get surprise—and hot—condensation splashed in your face when you open your mug for a drink. You can easily take the stopper apart for more thorough cleaning, plus the interior is coated with nonstick material. It can keep your coffee hot for up to six hours, so not as crazy-long as the LEXO, but still a pretty good stretch. Choose one of seven beautiful colors. 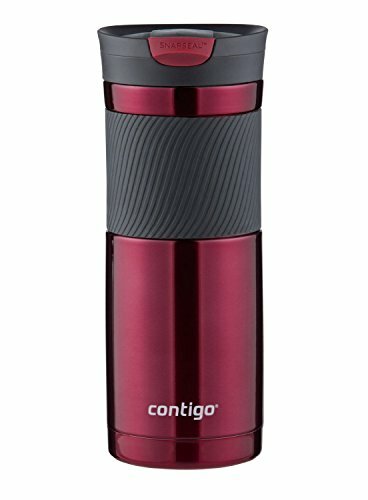 It might look like a regular travel mug, but the Contigo Autoseal West Loop is designed for the klutz in all of us. The lid is leak and spill proof. You just have to push a button to drink (easily done with one hand) and it have an extra lid lock for good measure. 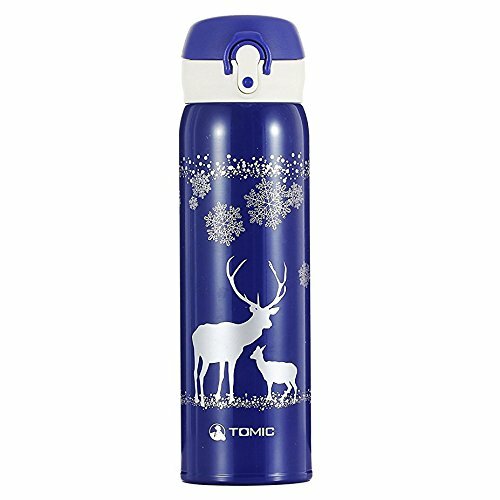 The lid is dishwasher safe (top rack only), but if you get one of the 15 colors available, you’ll have to wash the insulated mug by hand or the paint will peel. The plain stainless steel version is completely dishwasher safe, though. No matter the color, it’ll keep your coffee hot for up to five hours, and absolutely will not spill or leak. Go ahead. Toss it in your purse and head out the door. Dishwasher safe and vacuum insulated? Yup. If you’re looking for low-maintenance and hot coffee, you’ve found your solution. 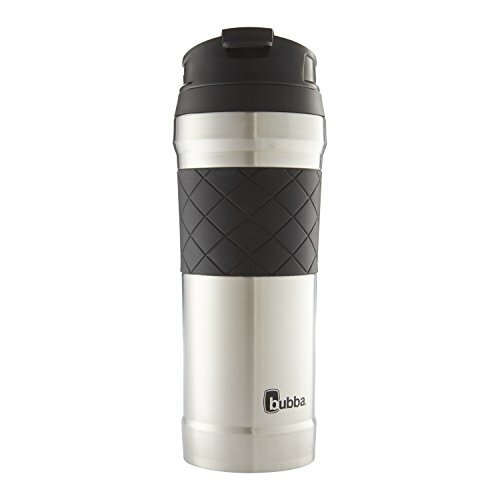 The Bubba HT can keep your coffee warm for up to six hours, plus it has a silicone base to keep your tumbler from sliding around in the car, or anywhere else. The lid isn’t too fancy, but it gets the job done. It clicks shut to prevent leaks and flips open easily, and the mug is available in two colors. 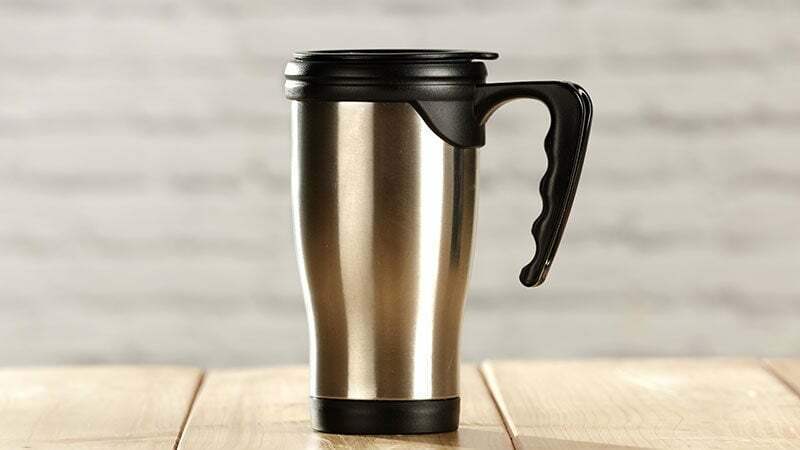 The slender design also means this stainless steel travel mug can fit most cup holders. Stylish, vacuum insulated, and completely top-rack dishwasher safe. There’s a lot to love in Ello’s Cole Mug. It has a built-in cork composite coaster base for a rustic look with a practical application—protecting surfaces and keeping your mug from sliding. The Cole comes in four color combos, fits most cup holders, and has a patented slider lid for easy, leak-free drinking. Best of all, your coffee can stay warm for up to five hours. If a self-closing lid isn’t your style, Contigo’s SnapSeal Byron travel mug is another option. But as long as the lid is closed, you don’t have to worry about leaks. You just pop the top to drink and snap it shut when you’re done. Like the West Loop, the Byron can keep your coffee hot almost all day—up to six hours. It has a nice grip around its circumference, making it easy to manage the stainless steel mug with just one hand. It comes in two colors, and plain stainless steel. 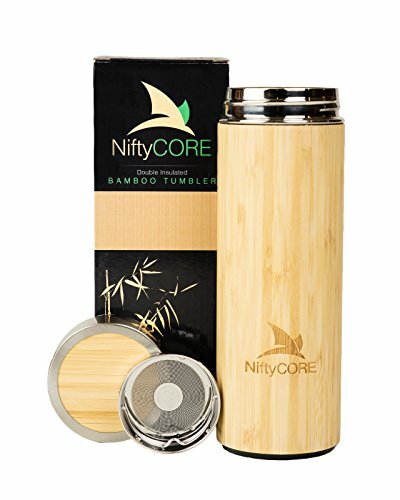 Between a double-wall vacuum insulation and a zen bamboo shell, the NiftyCORE Bamboo thermos can keep your coffee warm for hours without disrupting your style. The exterior surface is designed to protect your hands from heat and cold, so you’ll never get an accidental burn from a too-hot mug. It comes with a strainer too, if you take a break for a cup of tea. (Not that we think it’s likely, but the option is there. We guess.) And if you’re concerned about the environment, bamboo is an eco-friendly, sustainable material. Stainless steel can be good at trapping heat … and the stale taste of your last cup of coffee if you don’t clean it thoroughly. 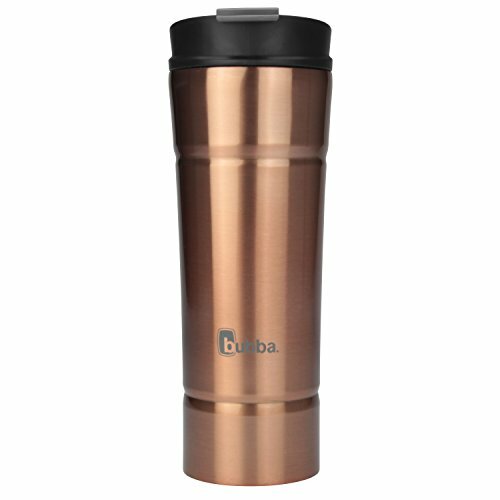 The Bubba Hero Elite has a ceramic coating on the inside of the insulated mug so you don’t have to worry about any lingering ghosts of coffees past. It has a silicone textured grip for a firm handhold on your mug, plus the same skid-proof base as the Hero HT. The insulation helps keep your coffee warm for up to six hours with no condensation, perfect if you’re looking to avoid any extra mess. Choose either stainless steel with black accents, or the all-black model. So it’s not really a coffee mug unless it has a handle, huh? No problem. 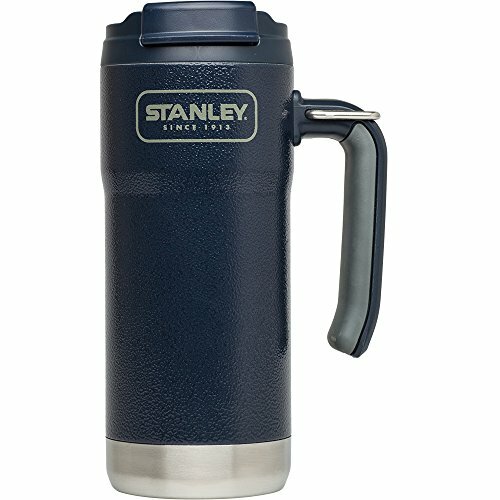 The Stanley Adventure travel mug has you covered. It even has a D-ring to clip to your bag, or your belt loop if you’re feeling brave and you decide to take it with you on a hike. The stainless steel, vacuum-insulated travel mug won’t rust, and it can keep your coffee hot for up to three hours. And in case you’re wondering, yes, this is the same Stanley brand that’s been around since 1913, and is known for its sturdy tools. Like the Ello Cole, the Campy blends style and science. 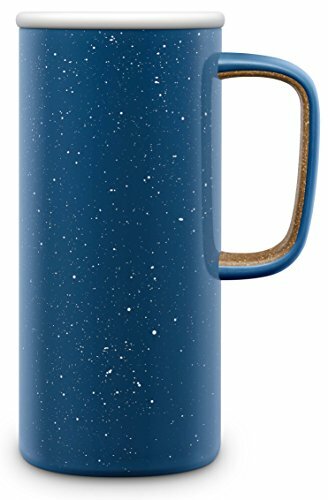 This vacuum-insulated, stainless steel travel mug is reminiscent of a classic speckled campfire mug, except with more room for coffee and a soft grip on the handle provided by cork lining. The leak-proof slider lid is top-rack dishwasher safe, but they recommend you stick with hand washing on the tumbler. It’s a little extra work, but worth it for the vintage style that keeps your coffee hot for up to five hours. Remember: the key to keeping your coffee hot while traveling is limiting exposure to cooler air. Invest in a vacuum-insulated mug, and keep the lid shut when you’re not sipping. If your coffee is too hot, taking the lid off for a minute or three will do the trick (unless you’re looking at the LEXO, since it cools your coffee for you). Just don’t forget to close it back up once you’ve hit your prime drinking temperature. Add any of these mugs to your coffee travel kit, and never suffer through another road trip with lukewarm coffee.